In today’s episode of PianoTV, we’ll be talking about musical canons. On this channel, we’ve done videos on other song forms, such as the waltz and the polonaise, but this one is going to be a little different. Today, we’re not just going to talk about what a musical canon is (though we’ll definitely do that). We’re also going to get into why learning musical canons are so crucial as a piano player, even at the beginner level. We’ll talk about why I think they’re one of the most important song forms to learn (along with their cousin, inventions, which we’ll discuss at a later date). Additionally, we’ll talk about why they’re so challenging. You’re probably sick of me referring to musical broccoli, but canons on the piano are definitely musical broccoli. They’re great for the brain, and for your hands. What is a musical canon? We’ve spent a bit of time talking about the song Canon in D on this channel. I made some simplified sheet music of the piece, and we’ve also done a musical analysis of it. Canon in D is definitely the canon most people are familiar with, so let’s use it as an example. A canon is an imitation-based song. 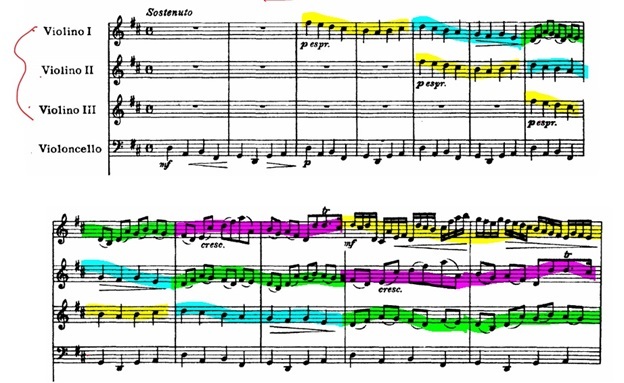 So in Canon in D, there are three violins are all playing imitation parts. The first violin part is the trendsetter. Then the second violin part plays the exact same thing but a couple bars delayed. The third violin copies the first violin, but at a delay of 4 bars. This creates a really neat overlapping effect. Let’s take a quick listen to what that sounds like, and then we’ll apply it to piano playing. What sets musical canons apart from their cousin, inventions, is that canons use direct imitation. This means that the copycat parts are identical. Inventions, on the other hand, do involve copying parts, but they can be altered a little. They’re not identical note for note. The word “canon” dates back to the 1500s, but canons have been around longer with other names, such as fuga ligata (fettered fugue). Some of the earliest canons were actually rounds. That’s basically where everyone sings the same lyrics, but staggered about a bar apart. Row Your Boat is a good example of this. Canons don’t always have to match identically. Sometimes, instead of moving in the same direction like in Canon in D, they can move in opposite directions (“inverted”). Sometimes the rhythm of the follower is altered, even though the notes are the same. This was really common in the Renaissance. So how does this translate to piano, and why is it such an awesome, but difficult, skill to have? Let’s start by talking about why canons (and inventions) are awesome. One of the biggest complaints that I hear piano players make, both beginner and advanced students alike, is that it’s very difficult to get each hand to do separate things. The left hand has a tendency to copy the right hand, or vice versa. Most modern music involves the left hand doing some type of chord or bass pattern, while the right hand deals with most of the intricacies. Those are things like the fast notes, the melodies and the fills. This means the left hand is mainly delegated to a “supportive” role, as opposed to the “active” role of the right hand. What this means is that when we encounter music that requires the left hand to take more of an active role, we have trouble with it. How many times have your fingers stumbled when you try to play a fast left hand pattern? Canons and inventions are an amazing way to practice this. Playing two-part canons on the piano are a great way to get the left hand more actively involved. Whether the left hand is the leader or the follower, its role is active, not supportive. Another reason I encourage learning canons in the beginner stages is because once you hit a grade 7/8 level, it’s time to learn some Bach Inventions. These are challenging, but so – SO – vital in becoming a more competent piano player. They’re great for your brain, too. Once you master Bach’s inventions, you can move on to his sinfonias, which are wild because instead of being in two parts (RH and LH), it turns into 3 parts. And since most of us only have two hands, this is a big challenge. And once you master the sinfonias, you can move on to his Preludes and Fugues. Those are his books The Well-Tempered Clavier, 1 and 2. Bach’s fugues are some of the most interesting writing you’ll come across, and some of the most rewarding to play. Chopin was said to have traveled with The Well-Tempered Clavier, considering it a great reference which he used it for his own personal practice. He also used it for teaching. It’s one of the major gold standard books in piano literature. So what makes learning canons a nightmare? The sheer brainpower required to play them. Playing canons requires a completely different way of thinking. You not only have to focus on the right hand melody, but you’ve got a left hand melody to contend with as well. When the right and left hand overlap, they’re doing completely different things. So it’s like you need to split your brain in two directions. It’s like each of your hands is on a different track. In my video on 5 finger exercises, one of the five exercises was a canon. If you tried to play it, you probably noticed that you had to think about it in a different way. Maybe it was more difficult for you to play than some of the other exercises – it was for me. Because of this challenge, I find a lot of my students shrink away from canons. But it’s because they’re difficult that we want to practice them! Use courage and face your fears! Learning canons is still useful. Even if you think that you’re never going to care to attempt Bach’s Well-Tempered Clavier. Even if you have no particular interest in Baroque music (where a lot of 2, 3 and 4-part music can be found). Oftentimes the most complicated piano music involves very independent hand movements. This is true of all genres, from Jazz to Baroque. Playing canons is just one way to train your hands to do two different things at once. Even if you have no interest in Classical music, you’ll still find the skills learned from canons useful in other songs. In the next video we’ll actually be learning a canon (aside from Canon in D, of course), and I’ll show you one of my favorite canon collections, which is available free online – so stay tuned for that.